The branch was founded on September 14th 1973 and founder member Margaret York, who became the first Chair of the branch. Margaret joined the Richard III Society in 1957 when, in the absence of local branches, she regularly travelled to London for meetings. Following the foundation of the branch Margaret became an inspirational leader, with her good humour and vast Ricardian knowledge she guided the branch during its early years. Margaret taught English, history and drama and is still remembered with affection by former colleagues and pupils alike. Margaret wrote some 50 novels, many of which featured Richard. The branch was proud that her service to King Richard was honoured when she was presented with the Robert Hamblin Award in 2010, recognising her work for Richard’s cause for over 50 years. Sadly, Margaret died on August 11th 2011, so she never knew that just two weeks later the first ground penetrating radar survey of the Greyfriars car park took place, which was ultimately to lead to the discovery of Richard’s skeleton in 2012. The branch began as the Leicester Branch and in the early days members volunteered to help out at Bosworth Battlefield at the weekends. In 1980 the name of the branch was changed to the East Midlands Branch to reflect that members came from Derbyshire, Nottinghamshire and Northamptonshire as well as Leicestershire. The branch was involved in the Memorial Stone to Richard being placed in the Cathedral. It was also instrumental in the erection of the James Butler statue of Richard III, originally in Castle Gardens. The statue was relocated to the Cathedral Gardens in 2014 and now stands between Richard’s original 1485 burial site and his tomb inside the Cathedral. 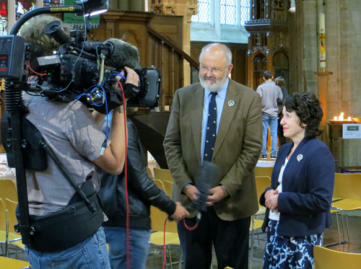 Over the years members of the branch have spoken to the media on numerous occasions on behalf of the Richard III Society, but especially after Richard’s discovery in 2012. We have made donations to many Ricardian causes over time including Sutton Cheney Church, Tewkesbury Abbey, Barley Hall, the plaque in Greyfriars Street in Leicester and most recently the banners beside the tomb in Leicester Cathedral. A bequest from Margaret York went a long way towards the cost of the banners. Many, very well attended study days have been organised on Ricardian topics. One entitled ‘Revealing Richard’ was held in November of 2014 as a special fund-raiser for Leicester Cathedral’s re-interment appeal. 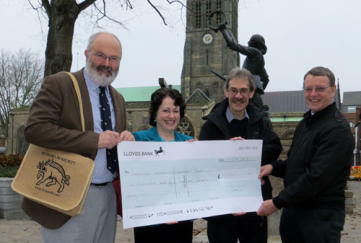 We were very pleased to be able to give the cathedral a useful donation towards the appeal. In 2012 the branch was in the media spotlight once again when Philippa Langley’s ‘Looking for Richard Project’ found the king on the site of the Greyfriars in Leicester. Members were very busy from the autumn of 2012 until after the re-interment in 2015 with enquiries, giving talks, interviews with the media and generally being the ‘people on the ground’. Several members also served on task groups at Leicester Cathedral for the re-interment of Richard III. During re- interment week members helped out in the Society’s Hospitality Suite in the Guildhall and were pleased to meet members from all over the world. The name of the branch was again changed in 2013, this time to the ‘Leicestershire Branch’. It was felt that as there is now a Notts and Derbyshire group and no longer a West Midlands Branch, the change of name was appropriate. The media also seemed to find the East Midlands name somewhat confusing! We are a friendly and active group and since the discovery of Richard in the Greyfriars in 2012, Leicester is now most definitely on the world map. We hold our meetings at the Richard III Visitor Centre, opposite the cathedral and all are welcome. We have a programme of speakers, organise study days and we have visits to places of Ricardian interests. The branch is also involved in services at the cathedral for the re-interment anniversary and the anniversary of the Battle of Bosworth. There is also always a branch presence during the Bosworth weekend. Do come along and join us and be a part of history. Following a special study day in 2014, the branch presented a cheque to Leicester Cathedral’s re-interment appeal. Seen here presenting the cheque to Canon Pete Hobson (right) are (left to right): Richard Smith (chairman) Sally Henshaw (secretary) and David Potter (treasurer). 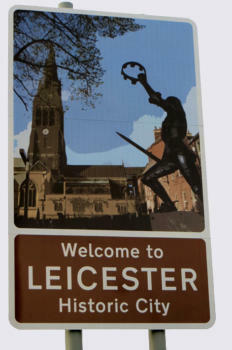 The road sign that now greets visitors to Leicester. Members have often found themselves giving interviews to the media. Here Richard and Sally field questions from a TV crew.